H.8607 – La Capanna represents one of the most significant beachfront residences ever created in Naples. Old world Italian renaissance era ambiance takes inspiration from an ideal beachfront location giving it the feel of a Mediterranean seaside resort. Beyond a gated entry, park-like grounds part to reveal a palatial 18,172 sq. ft. estate home that is unsurpassed. Includes a home theater, beach side game room, fitness center, pool side cabana with pergola covered spa, his and her studies, Guest House, 5-bay collectors garage and finishes that redefine luxury and quality. 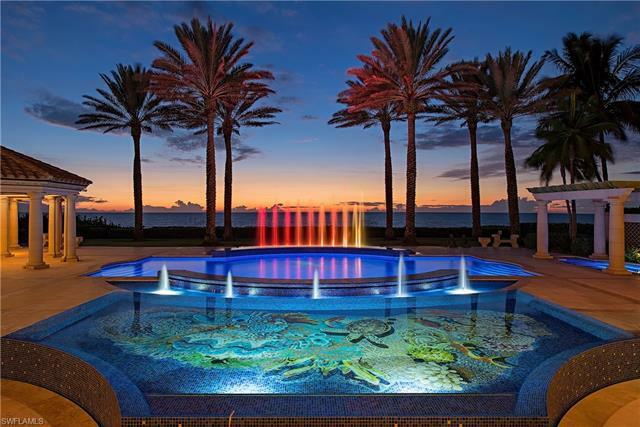 Stunning two story rotunda welcomes guests and offers immediate Gulf views. Relax or entertain in this handsome lounge, featuring a full Mahogany bar with emerald marble bar top, marble floors and a burnished faux finished coffered ceiling. Additional features include a 500 bottle wine room, state of the art electronics, whole house Crestron automation, interactive fountain with LED lighting and much more. Relax in the Zero Edge pool/reflection pool and poolside cabana with full kitchen that is ideal for entertaining. La Capanna is a masterful blend of design, craftsmanship & artistry by A. Vernon Allen Builders. The Real Estate Listing information for MLS 217030564 comes from the cooperative Broker Reciprocity Program in Florida. The Broker Reciprocity Program Icon is shown for all Broker Reciprocity Program Listings and the Detail Page includes the name of the participating Listing Broker. The real estate at 2750 Gordon Dr Naples FL 34102 may not be the only available Broker Reciprocity Program Listing in the community and Sun Realty may not be the Listing Brokerage. Information herein deemed reliable but not guaranteed or warranted and should be checked for accuracy prior to engaging in any transaction. This website indicates one source of ‘Market Value’ and we suggest that you look at several other sources to get the best idea of the Real Estate Market Value before entering into any real estate transaction. If you have questions about the value shown please contact Collier County Property Appraiser.